The video below is of Barry Schwartz talking about the paradox of choice. It’s something that faces us all everyday. Choosing what to buy is not as easy as it used to be. Simply popping to the corner shop to buy bread takes longer due to the enormous array of different types of bread available. Online shopping takes us a lot longer due to the amount of incredibly similar products and the fear that we may make the wrong choice. For the average person, this fear leads to many hours of researching and reading reviews so they hopefully make the correct choice. If you ask them, people will tell you that they like choices. Choices equal freedom. However, as Barry notes in the video, it has been proven that offering more choices actually makes choosing more difficult and ultimately to not choosing at all. More choices actually puts more stress on the person making the choice as they have to weigh up all the pros and cons of each. Eventually they either put it off until another day or they give up altogether. The solution is to offer the consumer less choice. You can also guide them into making the correct choice (or the choice you really want them to make!) via persuasive design. Through intelligent design, we can lessen the negative effects of the paradox of choice. 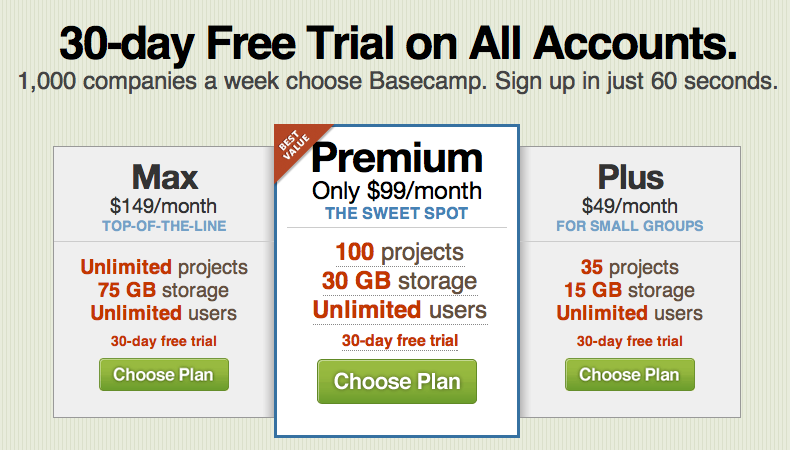 Basecamp’s pricing page has been designed to entice the user to the Premium plan. The benefit of this design is the user feels they have choices (yet not too many) and control yet the decision making is less taxing as it has already been done for them. I just want coffee flavoured coffee! The comedian Denis Leary performed a hilarious rant on his Lock n Load tour about how difficult it is to now buy coffee flavoured coffee. It certainly highlights why keeping choices to a minimum is a good thing and less stressful for consumers.